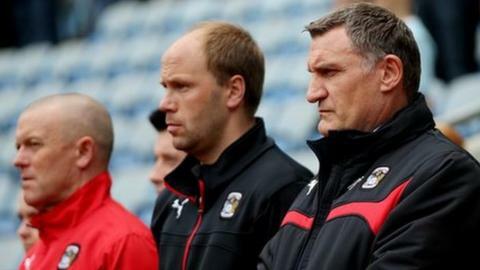 Coventry City assistant manager Neil MacFarlane has left the role after coming to a settlement with the League One club. The 37-year-old Scot was brought to the Sky Blues by Steven Pressley when he took over as manager in March 2013. He briefly took over as joint caretaker boss, along with professional development manager Dave Hockaday, when Pressley was sacked in February. MacFarlane and Hockaday stayed on when Tony Mowbray took charge on 3 March. Coventry City have made five summer signings - defenders Chris Stokes and Sam Ricketts, midfielders Romain Vincelot and Ruben Lameiras, as well as on-loan Newcastle United striker Adam Armstrong. The Sky Blues start their fourth season in League One with a home game against relegated Wigan Athletic on 8 August (15:00 BST). When Hockaday left at the end of the season, after the Sky Blues' final-day brush with relegation to League Two, MacFarlane remained, having signed a new deal in August 2014, following Coventry's return to the Ricoh Arena. He continued in his existing post even after Mowbray had brought in two more backroom staff, Mark Venus, his long-time number two at all his previous clubs, and Jamie Clapham. who worked under Mowbray in a coaching role at Middlesbrough. But the Sky Blues have now parted company with MacFarlane by mutual agreement, thanking him "for all his hard work during his time at the club". Venus, 48, initially came in as technical director, in charge of recruitment. It is yet to be confirmed whether he remains in precisely that role.